B&B Grocery, Meat & Deli has been providing the Des Moines community with great tasting homemade sausage. Try our homemade Italian Sausage, Chorizo, Garlic Sausage, and more. Our Hot Italian Sausage is famous in Des Moines and throughout the State of Iowa. B&B Grocery Meat & Deli started as a grocery store meat counter, but quickly transformed into a high-octane deli. B & B has 87 menu items and is one of the only places in town that still cuts meat from the carcass – no boxed meat. These self-proclaimed “old-school butchers” were awarded as having the “number one deli sandwich in Des Moines”. Not only do they make a killer sandwich, but the staff is entertaining as well. Stop in and sample B & B’s “Dad’s Killer Sandwich” or hire them to provide a cook-out menu at your next summertime soiree. Keep your guests satisfied by allowing them to load up on thick, fresh-cut sandwiches, egg rolls, gooey brownies, and zesty lemon bars. The South Side’s Italian neighborhood has a long, well-known history, but few people remember that much of the South Side was actually an independent town into the 20th century. Sevastopol, literally “venerable city,” was laid out south of our two rivers during the Civil War and was centered at Southeast 6th and Hartford. The city’s oldest food establishment still operates there, as if oblivious to time. Founded in 1922, B & B Grocery Meat & Deli is an old fashioned political hangout like no other. It’s difficult on occasions to tell the owners from the customers as so many people move behind the counters as if they work there. It’s one of the friendliest places in town — complete strangers are treated as cordially as neighborhood regulars. The food service is leftover from another era, too. I have been telling readers to visit this place for years in order to find pure pork, un-injected with sodium solutions, or to fill nostalgic orders for things like pig’s heads, carcass beef, whole hogs, head cheeses and souses, whole slabs of bacon, etc… B & B is also a reliable source of hamburger that has been ground fresh from a single carcass, an increasingly important distinction in the industrial age of E. coli and mad cow disease. I visited for the lunch service recently for two reasons. 1.) Their pork tenderloins, an Iowa icon, might well be the only ones in the state that go directly from the butcher block to the deep fat fryer in a single process. 2.) I feared their business might be slow because both their crossroad streets were closed for construction. Most other businesses would just shut down when construction projects stop traffic for a few weeks. Here, life goes on like a beating city heart transplanted into a new political body. The deep fryer separates this place from other deli counters in town. Its specialties include breaded tenderloins of chorizo, turkey, chicken and beef, as well as pork. When I ordered a beef tenderloin, someone walked into a cooler and came out with an entire tenderloin of beef to cut, tenderize, dip, bread and fry — for $4. A pork chop on a stick cost $3 and was superior to anything peddled at the Iowa State Fair this year. You can add French fries plus a side of coleslaw, macaroni salad or potato salad for $1.50. Or you can order side dishes from a menu of exotics such as chile poppers, chicken gizzards or livers, breaded oysters, fresh made deviled eggs, or potato chippers. Ribeye and Philly steak sandwiches also were under the $4 threshold. Burgers were served in one-third pound patties with singles, doubles and triples available, and $4.19 being the top price. On the cold side of the deli, I am partial to the kosher corned beef and pastrami here, the best $4 sandwiches of their kind in town. They have a large choice of hams, salami, sausages and roast pork. They will even make a sandwich out of head cheese and souse. The specialty of the house is the $5 Dad’s Killer, a hoagie that includes corned beef, roast beef, ham, turkey and three cheeses. Lots happened in Sevastopol since 1922. Supermarkets and cafés came and went, so did a Little League park across the street from B & B. Now things are coming full circle as East Village development moves south. La Pena, the best mom and pop Mexican café in town, opened a few block to the west, as did two good barbecues and Florene’s, a true scratch, butter and cream bakery. Sevastopol is again venerable, and B & B is still its foodie heart. Here’s an old-fashioned meat counter where you can order a beef carcass, a whole hog and a tuna salad sandwich with onion rings all at the same time. 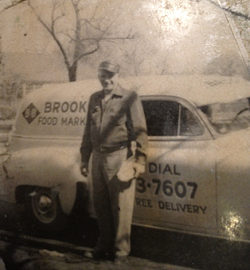 This long-time south-side grocery has been family-owned since May 8, 1922, when East High School students Archie and John Brooks opened the store. 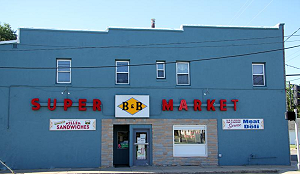 Come in to B&B Grocery Meat and Deli and you may find the chief of police, south-side politicians and local celebrities making small talk behind the meat counter. This is what lunch in the city is supposed to feel like. This is a place with real character. First off, remember this is still a grocery store. The deli counter where you order lunch is in the back, but all around the store hangs NASCAR memorabilia and decades-old sports junk, including baseball hats covered in plastic. Here’s where things get interesting. If it’s your first time, good luck trying to order a meal quickly. The menu – positioned over the counter like a scoreboard, and just as large – features about three dozen “killer” sandwiches, plus a handful of burgers, tenderloins and grill choices. For side dishes, choose everything from chicken livers and gizzards to cheese sticks and deviled eggs. Not a single menu item costs more than $5. The seasoned rib eye steak sandwich runs just $3.49 and comes as a tender, flavorful strip of steak on a toasted bun with smoked provolone cheese, perfectly grilled peppers and onions and a touch of A.1. steak sauce . But they’ll make it however you want it. I added fries and a small cup of potato salad for $1.50. A dining partner went with the famous “Dad’s Killer,” a behemoth of a sandwich that would fit snug in a shoebox. Roast beef, corned beef, turkey, ham, American, hot pepper and Swiss cheese, lettuce, tomatoes, pickles, mayonaisse, mustard and Italian dressing are crammed into this sandwich, which costs just $4.49. “Killer Sandwiches” that are to die for. The menu at Brooks B&B Super Market reads “Killer Sandwiches” – Killer sides, Dad’s Killer, Killer Chili, Killer Subs, Killer this and Killer that. Everything is called Killer! I didn’t know why until the goods hit the table. Most things we ate, and there were plenty of them, were pretty darn good. This take-out place at S.E. Sixth and Hartford sells a lotta things most supermarkets don’t sell. Besides the killer stuff, it carries normal stuff like milk, pop, flour, sugar, ketchup and napkins -and lot of other items not normally stocked on the shelves of your typical supermarket these days, like pork brains and beef oxtails. They had some monster hunks of dead cow (the sign on one hunk said it would make a dozen T-bones -good thing cutting is free). The meat case also held a good-sized hunk of hog. Believe me, this wasn’t your average cut of meat; you might need a jumbo Weber to wrassle that one to the ground! If you want lunch without having to grill your own meat, you can find it here. B&B sells Killer Subs, sold by the foot at $8.49 per, at any length up to 6 feet. We didn’t try one of those, but we did hit the rest of the sandwich menu pretty heavy. Take the Killer Sausage sandwich ($3.49) -burp! -with tangy sausage, lotsa peppers and mozzarella cheese. Or the Killer Unbreaded Loin ($3.39) -belch! -grilled and topped with hot pepper cheese. Real good stuff. The X-Large Breaded Piggy Pork Loin ($3.99) was tasty as well. All the tenderloins, be they Pork, Chorizo or Italian ($3.19 each), are home-made and pounded on site. Great stuff each and every one. Toss in a basket of Killer Flour Tacos (three for $3.99), a basket of Inferno Wings ($2.79), Jalapeno Poppers (four for $2.09), an order of rings and some cheese sticks and things are looking mighty fine for our group. After feasting and gorging and belching and pretty much making Fatboys out of ourselves, we had finally reached the end of the road. Did I mention that you can make any Killer Sandwich into a Killer Basket if you like? For an additional $1.40, they add criss-cross fries, and your choice of potato salad, cole slaw, or macaroni salad. The slaw was my favorite of the bunch. Bob, Becky, John Jr. and Joseph Brooks, along with Bob and Becky’s nephew Archie Brooks, keep the chow flying, so this is “mom and pop” at the ultimate level. Dad and sons cook and mom takes in the cash. That setup seems to work as well now as it did in 1922 when the first store opened at another location, or since 1962 at its current site! It seems like you could get just about anything your heart -or stomach -desires at B&B’s. Stop in for some great eats and some laughs as well. The crew seemed to be plenty chatty as they churned out the goods to a hungry noon-time crowd that ranged from blue-collar people to the suit-and-tie crowd (as well as the likes of Fatboy and the motley crew he runs with). Enjoy!